During 1969 Ferrari developed a sports racing model to compete in the 1970 Group 5 Sports Car Championship, this was the 512 S model, built to do battle with the Porsche 917. The regulations required that twenty five examples of the model had to be built to achieve homologation, and in January 1970 Ferrari presented the requisite number of cars to FIA officials in Maranello for inspection. The motive power was a mid-mounted 5 litre V12 engine with Lucas indirect fuel injection, producing a claimed 550bhp @ 8500rpm, coupled to a five speed + reverse transaxle. The body was available in either closed, berlinetta, or open, spider, configuration, and the fibreglass panels were mounted on a semi-monocoque chassis in aluminium with a supplementary steel tube frame. For the Le Mans 24 Hour Race a �coda Lunga�, long tail, body section was available, which was designed to provide greater aerodynamic efficiency on the long Mulsanne Straight. 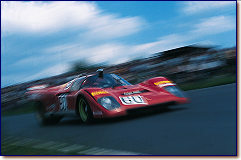 The 512 S model ran through the 1970 season both as works and private entries, its best result being a victory on its second outing in the 12 Hours of Sebring, this being a works entry driven by Andretti/Giunti/Vacarella, with Andretti joining the driving squad after his own car retired with transmission failure when leading. A 512 S also won the non championship Fuji 200 Mile Race in Japan, and a 512 M version won the Kyalami 9 Hour Race in South Africa. Although there was little to choose in performance between the 512 S and the Porsche 917, the latter had the greater reliability, which enabled it to take the Manufacturers� Championship. 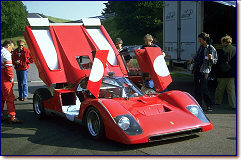 For the 1971 season, Ferrari concentrated on their 312 P(B) sports prototype, and left the 512 entries to the privateers, although they did offer a revised more aerodynamic body package, which had first appeared on the Kyalami winning car in late 1970. This was called the �M� package, �Modificato� or modified, featuring a more wedge shape flatter profile, and all cars converted to this form were coupés. In the USA the Roger Penske team developed their own 512 M, chassis # 1040, which was the quickest 512 of all time, but like the regular cars didn�t meet with much overall success, with no 512 victories during the season. Late in 1971 chassis # 1010 was fitted with a 7 litre engine and converted to run in the American CanAm series. It managed a 4th place at Watkins Glen driven by Mario Andretti, before the car was sold to the NART organisation. were later converted to m (modificato) specs. (also the serial number 900 was unused).